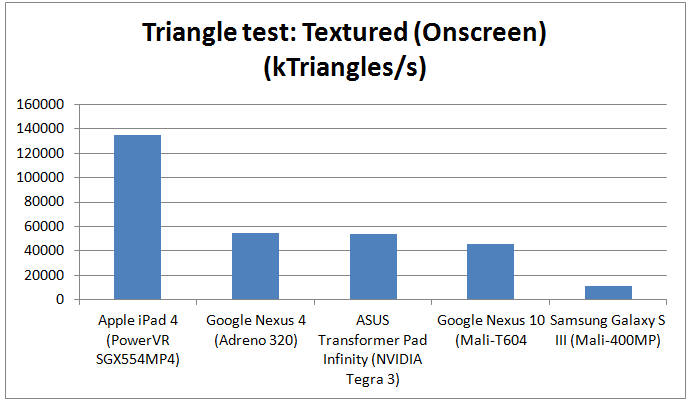 Google's new Nexus 10 tablet, which was developed alongside Samsung, features some killer specs, most notably, the unsurpassed screen resolution of 2560 x 1600 pixels. 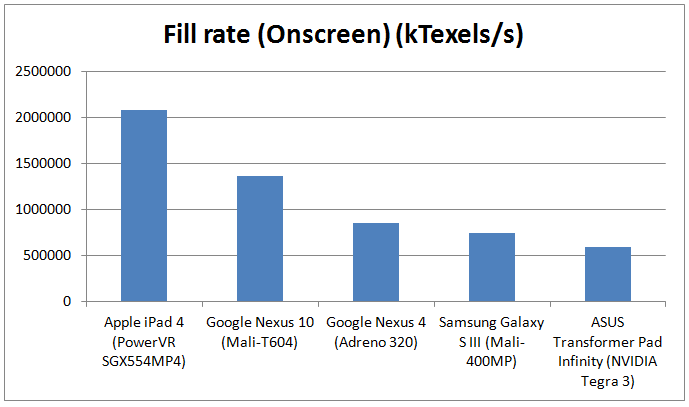 This immense resolution results in a fine 299ppi pixel density, surpassing even the iPad's 264ppi display. However, performance demand is proportional to resolution, therefore, to be able to power such a powerful display, Google needed an extremely powerful SoC, something of the likes of Apple's A5X SoC. Well, Google has done right in choosing Samsung's brand new Exynos 5250 SoC. The Exynos 5250 is built on Samsung's successful 32nm HKMG (High-K Metal Gate) process. Less than a year ago, all SoC manufacturers were bound to Cortex-A9 CPUs, so there was no real competition in terms of single-threaded performance, since it was all the same. Today, of course, the story is different. ARM's Cortex-A15 architecture leveraged certain ARM-based CPU designing companies into making similar architectures. Currently, we have three new architectures competing with each other, Qualcomm's Krait, Apple's Swift, and ARM's Cortex-A15. The real difference between these is single-threaded performance. 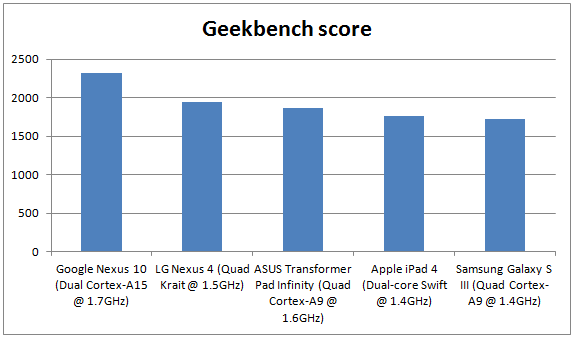 While the Swift didn't really surprise anyone, and Krait, well, did a pretty good job, the Cortex-A15 is just astounding on a per-core basis. Indeed, one A15 core is about twice as fast as one Krait core. Now, The Exynos 5250 has two A15 cores clocked at 1.7GHz, which theoretically should translate into the best mobile CPU performance ever seen. Now let's see how two A15s @ 1.7GHz fare against the Quad-core Krait @ 1.5GHz and the dual-core Swift @ 1.4GHz. The Exynos 5250 in the Nexus 10 distinguishes itself clearly from the rest of the competition, and it does that, while also being one of the few who have only two cores (granted, it has the highest clock). Comparing it to the only other dual-core processor there, the Swift, found in the Apple A6X flagship SoC, we can see that per-core efficiency is unprecedented in the Cortex-A15. The main constraint that a high-resolution screen poses is memory bandwidth. 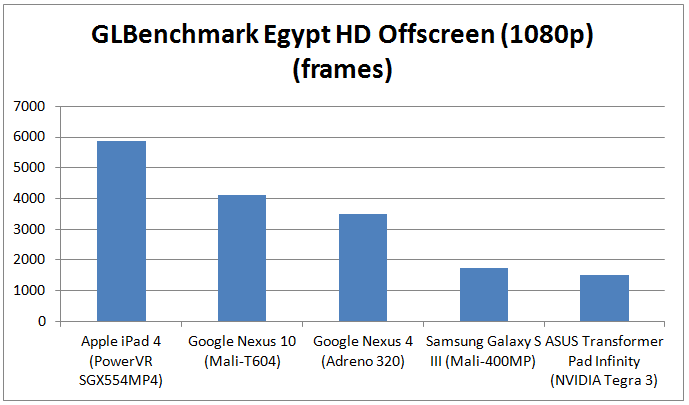 Considering how bad Android devices' SoCs usually do in terms of memory bandwidth, the Exynos 5250 was a true surprise. This SoC contains a dual-channel DDR3-1600 (800MHz) memory controller, bringing the theoretical memory bandwidth to a PC-class 12.8GB/s. Apple's A5X and A6X chips (both powering an iPad's Retina display) both achieve the same bandwidth as the Exynos 5250, theoretically speaking, only with a much wider memory interface (quad-channel LPDDR2-1066). That said, the Exynos 5250 is the first non-Apple SoC ever to be able to power such a fine display as the Nexus 10's. Another big surprise that comes with the Exynos 5250 is the brand new Mali-T604 GPU, built by ARM. It is the first GPU to use ARM's new midgard architecture, which is a new unified shader architecture. 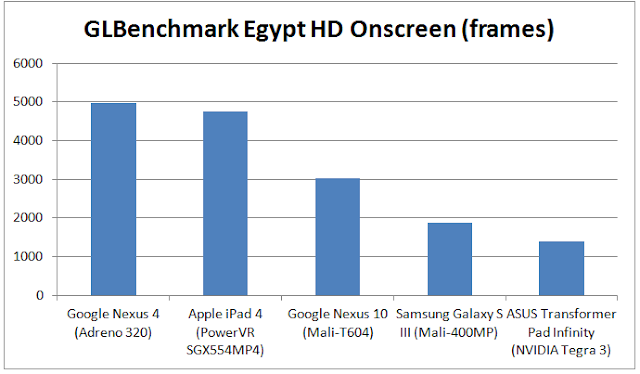 As we will see in the benchmarks below, the Mali-T604 kills the GPU inside the A5X, but lags behind the A6X. At any rate, it is by far the best GPU on the Android space. Despite the theoretical memory bandwidth of the Exynos 5250 being equal to Apple's A6X, we clearly see that there is a huge gap between the A6X's maximum fill rate and the Exynos' maximum fill rate. Aside from the A6X, the Exynos 5250 shows excellent fill rate, leaving the other competition in the dust, and it should surely be able to handle properly the Nexus 10's immense display resolution. Unfortunately, we see in the Offscreen Egypt HD test that the iPad 4's PowerVR SGX554MP4 GPU is actually significantly stronger than the Mali-T604, which only edges ahead of the Adreno 320. Still, it performs very well, and is the most powerful GPU on the Android space. The Onscreen test shows us the sad reality that the 2560 x 1600 display is a bit too demanding for the Mali-T604. The overall weaker GPU, combined with the significantly higher reolution, resulted in the Nexus 10 performing much worse than the iPad 4. Despite that, and taking into consideration the unprecedented resolution, the Mali-T604 does offer some reasonably good performance, and should suffice for most gaming uses. Here is the part where Mali GPUs always get disappointing. ARM's GPUs have never been very good at their triangle throughput. We can see that the T604's midgard architecture has really improved Mali's triangle throughput, looking at the improvement since the last-gen Mali-400MP, but it is still humiliating for ARM. 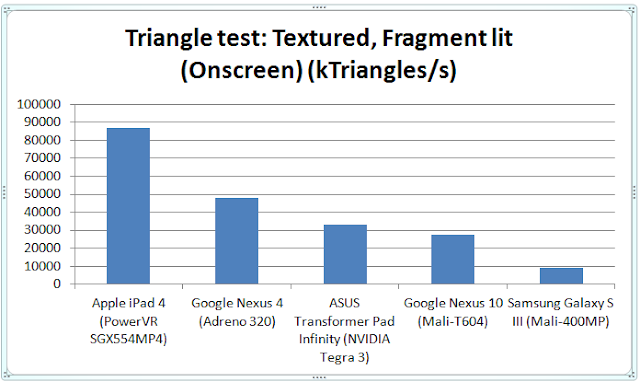 The triangle throughput isn't even comparable to what the iPad 4 offers, and even the 1-year-old NVIDIA Tegra 3 edges ahead (granted, triangle throughput is NVIDIA's forte). It should be good enough to power most games, but in situations where the polygon count is very high, the weak triangle throughput could act as a performance bottleneck. We've seen that the Samsung Exynos 5250 has its strong points, but we've also seen a weak side to Samsung's new flagship SoC, although the vast majority of the SoC's features are excellent. The Exynos 5250 is a very interesting SoC because it uses new architectures for almost everything; it is the first to use ARM's Cortex-A15 CPU design, and also the first to have ARM's new Mali-T604 GPU. As a result, the midgard architecture also debuts with the Exynos 5250. Unlike most of the current SoCs, the Exynos 5250's features are all fine, from the die process to the CPU, the GPU and the memory controller. We also get the best from power efficiency, thanks to Samsung's 32nm HKMG process and the Cortex-A15, which proved to be quite an efficient CPU. The Nexus 10 is a very demanding device, and the Exynos 5250 is the only SoC capable of satisfying the new slate's needy demands.